Listen to the stories or read them yourself. Enjoy the animations and try the many activities. 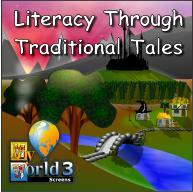 Traditional Tales supports the Literacy Hour with activities which encompass - Reading and Writing, phonological awareness, High Frequency word recognition and vocabulary extension, sentence construction and punctuation. There are over sixty interactive screens, full of amusing and colourful illustrations. Create your own pictures, tell a story or write a review. "Literacy Through Traditional Tales" will be a favourite with children in KS1 and will help to support SEN children at KS2..."They'll all live happily ever after!" For younger children who need practice in basic skills such as mouse control there is also a great deal to be gained from free exploration.